Eighteen percent (18%) is added to all past due invoicing over 45 days. Prices quoted are in U.S. Dollars and are for United States and Canadian customers only. Prices are subject to change without notice. All above pricing supersedes all previously issued pricing offers, discounts and guarantees. All AutoPREP processes patented or patents pending. 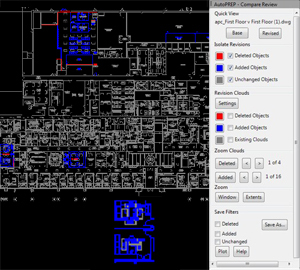 AutoPREP "DWG Compare / Review"
The “Compare Feature“ will automatically discern and delineate any and all modifications between drawings utilizing precise digital imagery interfacing. Delineation is accomplished by placing a“Revision Cloud” around each added and/or deleted design entity or text change. It can also graphically illustrate all modifications by “Contrasting Colors”. The unchanged portion of the drawing can be changed to a user defined solid color with contrasting colors for additions and/or deletions. In this way all modifications are clearly depicted for a concise permanent record while making it much easier to visualize any impacts caused by the highlighted entities within the drawing. Required revisions can be easily determined to confidently expedite change orders or tweak projects schedules. Even more definitive and proactive is the ability to isolate and display only added and/or deleted entities on screen. 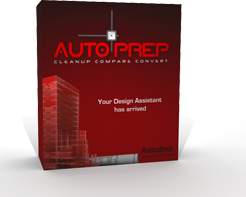 AutoPREP’s “Drill Down Zoom” capability can also provide automated material and labor pick off’s by filtering to specialized system components for compilation and transfer to third party pricing or scheduling programs. This will be especially useful for BIM related projects. There are numerous zoom and colorization options available along with the ability to quickly tile between the Great for BIM Related Projects!